Well, that is simply because I have decided to post a pizza therapy once a week or so. What is a pizza therapy? I hear you say… Or maybe you didn’t say that but here it is just in case you might have thought about it: On this blog, a pizza therapy is a recipe for any kind of pizza, including a short motivation message to bear in mind while eating it. If, like myself, you love pizza this WILL brighten your week! I hope you enjoy this post and your delicious pizza! 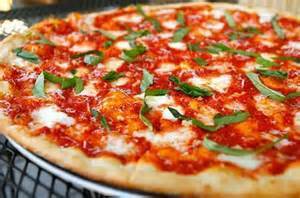 I am in no way a professional cook, although I am half Italian and I take part in numerous cooking classes, especially pizza making! So we are going to start off simple, with the all-time classic Margherita! This recipe will show you how to produce two delicious pizzas, so let’s get started! I have uploaded this picture on the internet aswell, this is what your pizza should look like when done! The first thing you are going to want to make, obviously, is the base! If you are using a ready-made base, skip this step and read on! Pour your flour into a large bowl, then stir, while adding in the yeast and salt. Make a ‘volcano shape’ out of the dough, and pour in 200ml warm water and the olive oil. Mix with a wooden spoon until you have a soft, fairly damp dough. Sprinkle some flour on a counter and place your dough on it. Knead for 5 mins until smooth. Then you’re going to cover it with your tea towel and set aside. SMALL TIP: If the dough is too wet: Add a bit more flour and work it in. If dough is too stretchy to roll out: Leave it to rest for 10 mins or so, then try again. Now that your base is ready, the most essential thing to prepare is the sauce! Mix the passata, basil and crushed garlic together, then add as much or as little salt as you want, make sure to taste it a few times to make sure that it isn’t too salty, trust me on this one, I learned it the hard way. Leave to sit at room temperature while you start working on the base. If you’ve let the dough rise, give it a quick knead, then split it in half. Make two balls out of the two portions of dough. On the same floured surface as before, roll out the doughs, about 25cm across, using a rolling-pin. The dough needs to be really thin. Now move the two rounds onto two floured baking sheets. You’re almost done! Now for the toppings. Since this is just a Margherita, it is quite simple, but sometimes, the beauty is in the simplicity. Heat your oven to 240C/fan 220C /gas mark 8. Put yet another baking sheet or an upturned baking tray in the oven on the top shelf. Pour your sauce over your delicious looking bases with the back of the wooden spoon that you used earlier, clearly you should wash it before doing this. Scatter cheese and tomatoes on then, drizzle with olive oil and season. Put one pizza, still on its baking sheet, on top of the preheated sheet/tray. Bake for 8-11 mins. Serve with a little more olive oil, and basil leaves (optional).Repeat this for the other pizza aswell. So there we are, your pizzas are now complete! Here is your weekly quote: :Do the difficult things while they are easy and do the great things while they are small. A journey of a thousand miles must begin with a single step. So that’s it for this post, I hope you enjoyed! P.S. I will be co-owning this account with one of my close friends. In the next post, she will be introducing herself and giving you her personal stories, as well as delicious pizza recipes!